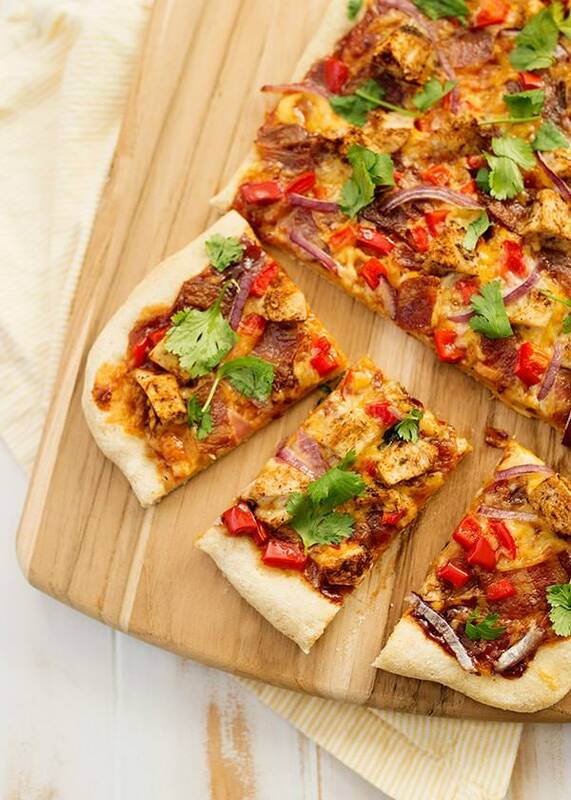 Sheet Pan BBQ Chicken Pizza is made on a crispy cream of wheat crust. Topped with BBQ sauce, gouda cheese, bacon, onions, and peppers. Sprinkled with fresh cilantro. So good. I was cleaning out a binder of old recipes and a piece of paper fell onto the floor. I picked it up and found my friend Martine’s recipe for cream of wheat pizza crust. 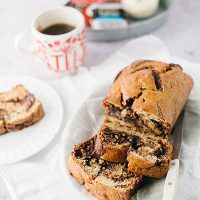 I hadn’t made or even thought about this recipe in years, and instantly it made me a.) miss her, she’s hilarious and we’ve had a lot of laughs together and b.) mad at myself that I’ve gone this long without having her delicious barbecue chicken pizza. When we lived in Nova Scotia, we all had really small children and lived in the middle of nowhere. Even if we wanted to go out, there weren’t a lot of places to go. To entertain ourselves, we had dinner parties all. the. time. At least once a week we were either at a friend’s or having friends over for dinner. Looking back, it was such a fun time in our lives. Our kids all played, we cooked together, ate delicious food, drank lots of wine, and laughed a lot. The best thing about living all over are the people that we meet. We have met so many incredible people because of this crazy life. Finding this recipe on my floor instantly brought me back to our time in Canada. I love that when I look through my recipe binder, I find little pieces of people that we have crossed paths with. So many of my recipes are from get-togethers and parties and dinners at friend’s houses. So, you are probably thinking that I am nuts for putting cream of wheat into a pizza crust. My best guess is that someone was making a pizza crust and ran out of flour and figured they would try cream of wheat and see what happens. The end result is a crust that is chewy, and has just a teensy bit of crunch. When making a sheet pan pizza (or Sicilian-style) I like to use this crust. It’s easy to press into the pan and the bottom gets nice and crisp. 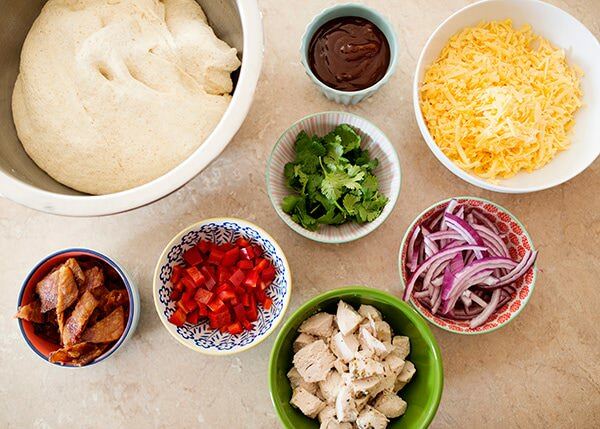 This dough makes at least 2 quarter-sheet pan pizzas. 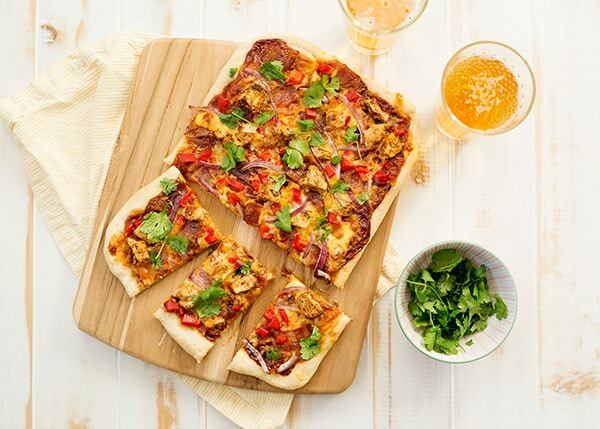 I like a thinner crust, and could possibly get 2 1/2 – 3 pizzas out of one recipe. I know it’s weird, but trust me. It’s such a good crust. Start with warm water. If the water is too hot, it will kill the yeast, too cold, and it won’t activate. 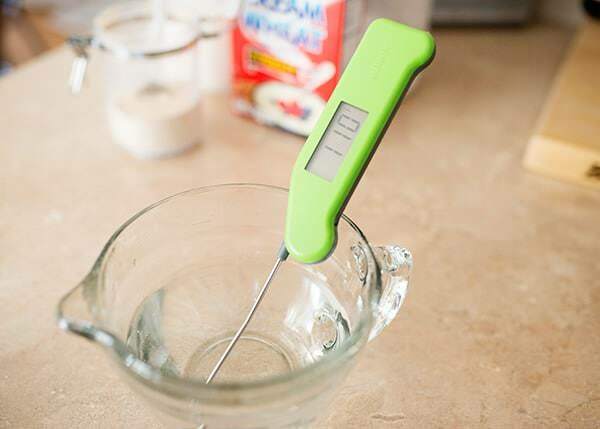 I’m a nerd and use a thermometer. Add yeast and sugar. Mix and let stand until it starts to foam. It takes about 5 minutes. 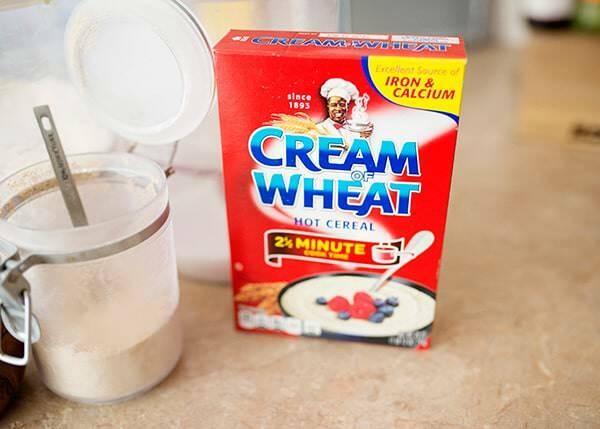 Add the flour, cream of wheat, and salt. 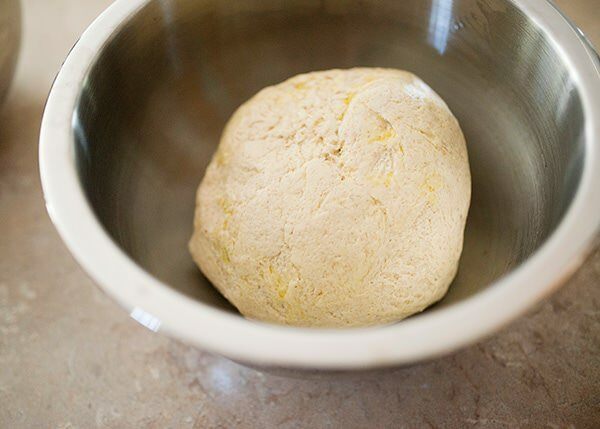 Knead until the dough comes together. 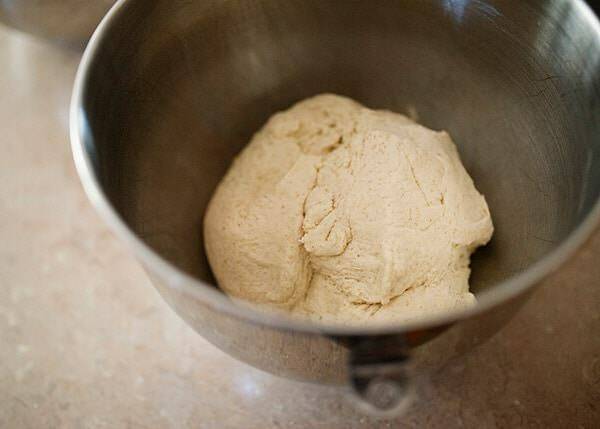 If you press on the dough and it springs back, it is kneaded enough. It takes about 5 minutes in the mixer fitted with a dough hook. Grease a large bowl with olive oil. Add the dough. Cover with plastic wrap. 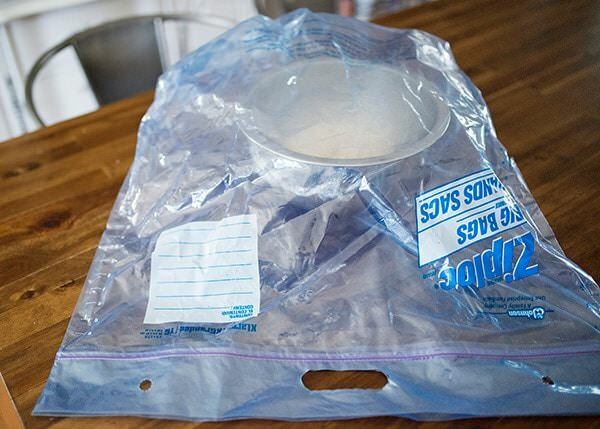 My fool-proof way to rise dough is to put it in a large Ziploc bag. I use this one over and over again just for this task. It creates a draft-free, warm environment that dough loves. Let the dough rise until it has doubled, about an hour. 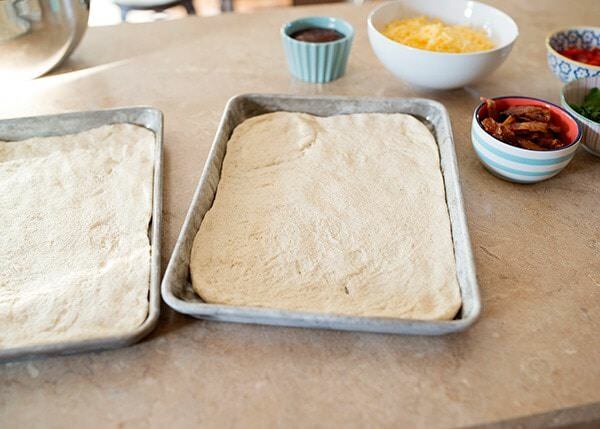 Divide the dough in half. Spray a quarter sheet pan with cooking spray. Press the dough as evenly as you can into the pan. Spread a thin layer of BBQ sauce over the dough. Generously sprinkle the cheese over the surface. 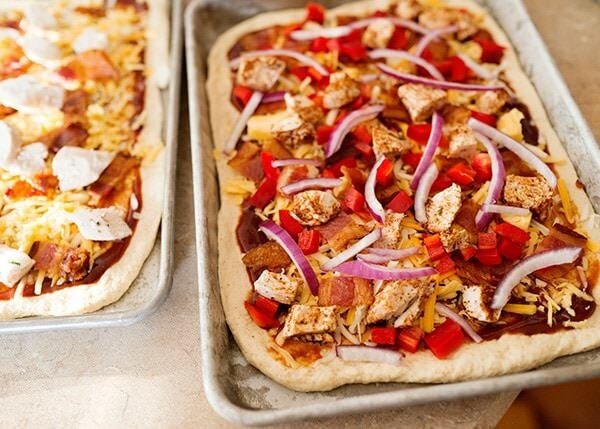 Top with bacon, peppers, and onions. Bake for 10-15 minutes or until the dough is cooked through and the cheese is melted. Top with chopped cilantro. 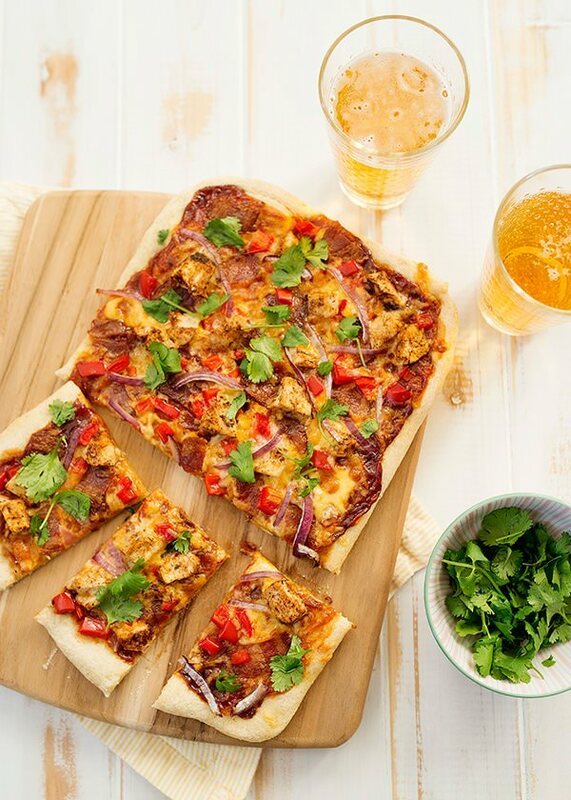 Sheet Pan Barbecue Chicken Pizza is made on a crispy cream of wheat crust. 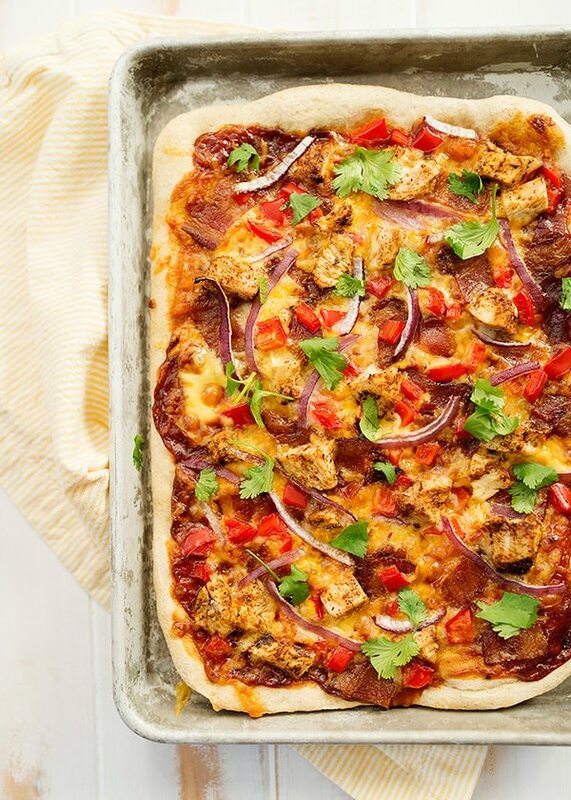 Topped with BBQ sauce, gouda cheese, bacon, onions, and peppers. Sprinkled with fresh cilantro. So good. 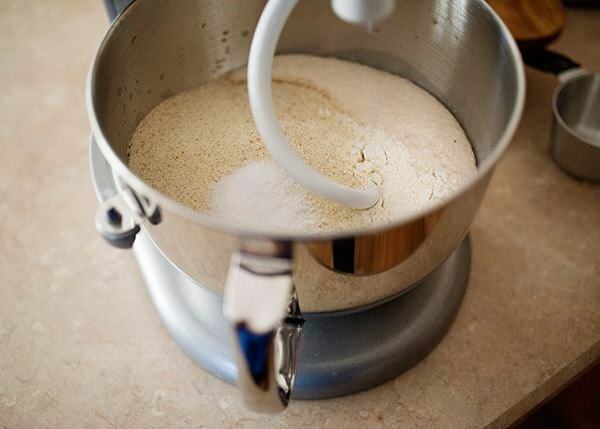 Start with warm water in the bowl of an electric mixer fitted with the dough hook. Between 105° and 110°. Add yeast and sugar. 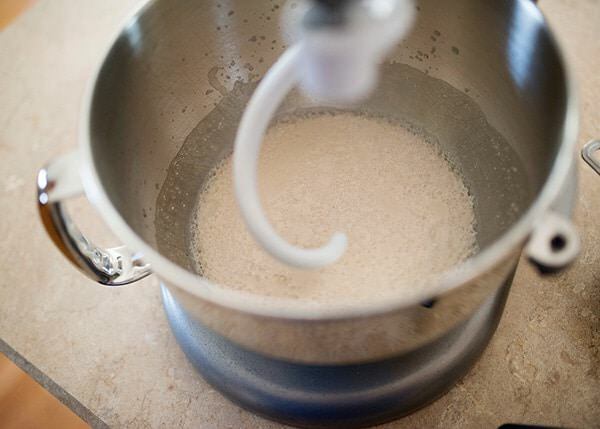 Mix and let stand until it starts to foam. It takes about 5 minutes. Grease a large bowl with olive oil. Add the dough. Cover with plastic wrap. Let the dough rise until it has doubled, about an hour. I love your honesty! I and I am sure many many others cooks/bakers have their weird ways of preparing food. It’s almost like a athletes who have certain rituals they do before a game. 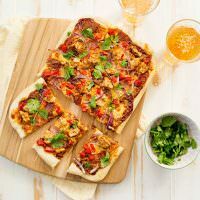 Anyway this crust recipe looks intriguing and will give it try. And by the way our family is leaving this week to Nove Scotia for a vacation! True! I love this crust and so glad that it has reappeared in my life. Have a great time in NS! can you advise on the size of the yeast? A packet is 2.5 teaspoons.